Are you planning a trip to the Baltics in the near future? 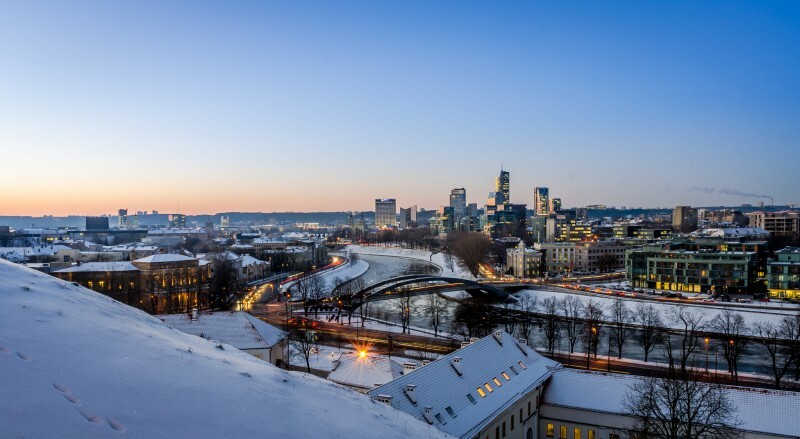 Check out where to stay in Vilnius in this guide explaining the best areas and much more about the picturesque Lithuanian capital. Lithuania is one of the smallest EU states in terms of population, and Vilnius, is a charming and compact European capital. Since the country has joined the EU, and with the expansion of low cost airlines, Lithuania is experience more influx of foreign visitors. Vilnius is the perfect European get away, if you want to experience a difference atmosphere, where East meets the West. The city is also a great stop if you are doing a longer travel in the Baltic region and Eastern Europe. Vilnius is just a few hours drives from Minsk, in Belarus, as well as Poland, Latvia or Kaliningrad(Russian enclave). If you are coming by train, there are not many options to get to Lithunia though. Lithuania has a pretty good domestic railway network, but international services are not frequent. The most frequent international train lines in Vilnius connect the city to Minsk in Belarus. An alternative to get from Vilnius to other smaller cities in the region is using several international bus companies operating in Lithuania. You can also get more information about tourism in Lituania on their official government website. Vilnius is a pretty compact city, and despite being the capital of Lithuania it has a population of slightly under 600 thousand inhabitants. The best places to stay in Vilnius are the old town and area around the Vilnius train station. The old town is the best area to stay in Vilnius. This area is in fact pretty compact, and you can easily walk between the main attractions of Vilnius without a lot of effort. Within the Old Town, you can consider the Gediminas’ Tower (Gedimino pilies bokštas) and the Vilnius Cathedral (Vilniaus Katedra). A good suggestion to consider is staying near the Gediminas Avenue (Gedimino prospektas), the most prestigious in the city. 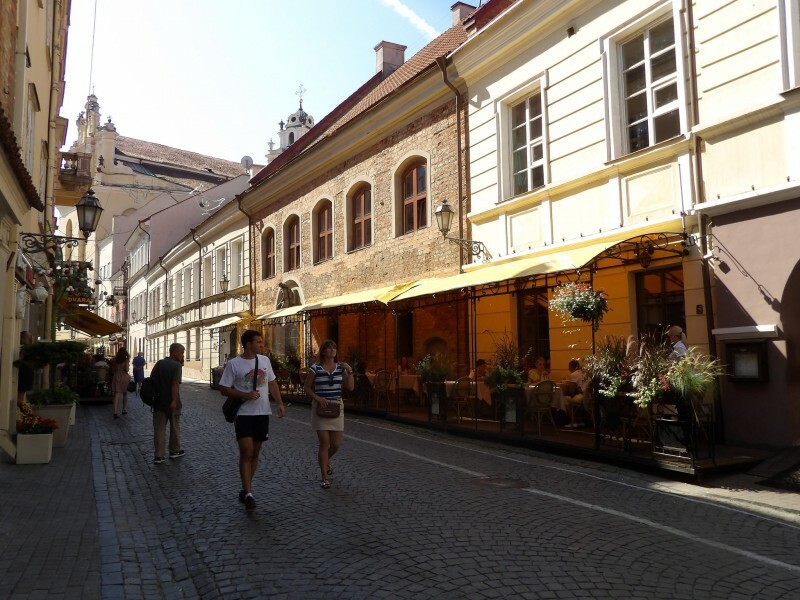 This street starts right next to the Vilnius Cathedral and it is a great option for restaurants as well as shopping. The area around the Vilnius Train Station (Vilniaus geležinkelio stotis) is another great option to stay in Vilnius. The Vilnius Train Station has a pretty central location in the city, and it is at a walking distance to most of the attractions in the old town. Apart from the proximity to the train stration, hotels closer to this area tend to be cheaper than those at the heart of the old town. If you want to know more about traveling by train in Lithuania, check our post on trains from Vilnius. Vilnius Home Bed and Breakfast – a charming Bed & Breakfast in the old town of Vilnius, featuring a shared kitchen. Pogo Hostel – an excellent hostel in one of the best areas to stay in Vilnius. Bernardinu B&B House – an cozy bed and breakfast just a short walk to the Gediminas Castle. Hotel Panorama – a great hotel with easy access to the Vilnius Train Station and the old town. Imperial Hotel & Restaurant – a great luxurious hotel in the old town with a unique interior decoration. Kempinski Hotel Cathedral Square – an sumptuous hotel right next to the Vilnius Cathedral, in a great location in the old town. Vilnius is a relative affordable city for European standards and you might even find it cheap if you are coming from Western Europe, Australia or North America. It is important to note that prices in Vilnius have increased over the past years. That was especially the case since Lithuania adopted the Euro currency in 2015. Pricewise, Vilnius remains quite attractive and can be well enjoyed even if you are in a budget. Firstly, getting to Vilnius is quite inexpensive if you are already in Europe. A number of low cost airlines have upgraded their frequencies to Vilnius. When it comes to accommodation and food, the options in Vilnius are quite a good surprise. I recommend visitors to try the local Cepelinai a stuffed potato dish. Another option is trying the local pancakes. A good restaurant called Gusto Blynine offers them at pretty affordable prices. Getting around in Vilnius can be rather complicated though. If you are outside the old town, it can take quite a while to get to the old town, as the public network relies on buses and trolleybuses. For that reason it is extremely recommended to be in the old town or at a walking distance to it. Unlike most of the European capitals, Vilnius do not attract hordes of tourists. Even during the high season you will not feel that tourists are overtaking the city. That also results in Vilnius being one of the European capitals with the least number of tourist traps. Lithuania has a continental climate and four very defined seasons. Vilnius has a pretty mild climate during most part of the year, and from April to September, the city is ideal for long strolls around its old town. Early Autumn (September and early October) might be a great option to visit Lithuania and the Baltics. Golden leaves give a quaint atmosphere to the region, and Vilnius is especially beautiful and quite pleasant in late September and earl October. The least attractive time of the year to visit Lithuania is certainly during the winter months. January and February in Lithuania are pretty cold and temperatures are freezing during most of the days. If you are traveling around the Baltic States you might want to check our guides on where to stay in Tallinn and the best places to stay in Riga.